The second installment of Outlier’s Workwear Week is now live. Check out this hoodie! 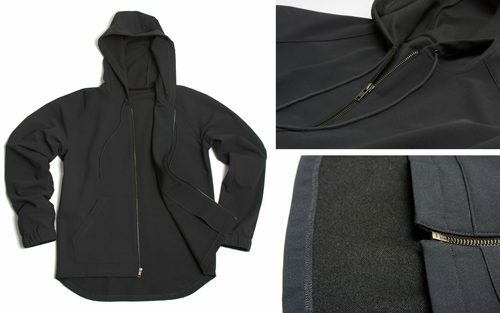 Next up in our experimental drop, the first Outlier hoodie in our Winterweight fabric. The cut is clean and minimal. Raglan sleeves for a full range of action, a big hood that can go over helmets and a long back to keep you covered when riding. An elegant yet tough winter layer that works flawlessly as a spring jacket too. The Schoeller Dryskin Extreme + 3XDry fabric is perfect for the cool and the cold months. The inside is a heat retaining fleece, soft and warm. It stretches, breathes great and wicks moisture away from your body for maximum comfort in both motion and stillness. On the outside it’s highly water resistant to keep the elements from ruining your comfort. The exterior weave includes Cordura for real durability and abrasion resistance. When I first tested this fabric I crashed a bike, the bike was ruined, my body bloody and the fabric barely even scratched. The cut runs classic, a bit smaller than the inflated sizes of many contemporary American brands. Designed to be the second or third layer from the skin. If in doubt between two sizes, or if you want to rock it with big sweaters underneath, err towards the larger size. Limited edition of 9 and not in full production until next fall at the soonest. Ships in January.